Long ago and far way, before I got married and had kids, I worked in Manhattan for five years, almost three of which I spent living downtown in what is now chic NoHo. I’d say (and I often do) that such a biographical detail lends me an urban edge, but 12 years later, that edge has just about disappeared. What I have retained, however, is the mythical city-girl handbook I used to carry; the informal list of safety rules I used at all hours of the day or night in that big city long ago, but have since shelved for only occasional browsing when I find myself in a big city without my car, or my husband, or a city dweller to hold my hand. 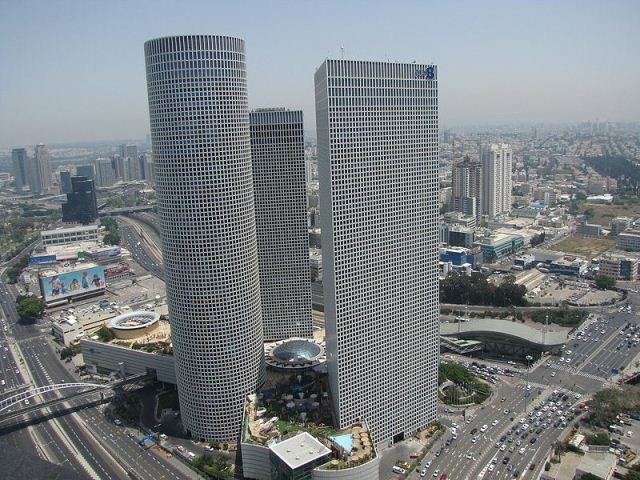 After attending a work event in the outskirts of Tel Aviv, I was dropped off by my colleague in front of the Azrieli center downtown. We had just spent the day kicking off Israel’s 2012 Agritech conference with about 200 others at the AgriVest Summit, a conference where investors and entrepreneurs explored big topics like feeding the world and solving the global water crisis. After getting dropped off at the center in front of one of the three towers at Azrieli, I was tired but still breathing in the fumes of post-conference self-assuredness. I thought my task would be easy: Find the Crowne Plaza Hotel, which supposedly was located somewhere in the Azrieli Center. Looking up to the top of the skyscrapers, I could see signs that indicated the shopping mecca inside: H&M, Forever 21, Fox. But I couldn’t see a sign for the hotel. Don’t panic, whispered the tall skinny girl sipping a frappacino on the cover of the city-girl handbook.When you don’t know where something is, she reminded me, ask a policeman or a taxi driver. Hmm…I thought, maybe I should find a policeman. On my way to find the café, I happened upon the Crowne Plaza City Center exactly where it was supposed to be, in the lobby of one of the three towers. As I approached the reception area, I had to decide who I wanted to be: Israeli resident or tourist? When we’re in the big city, where you often find tourists, we olim get to choose — do our best attempt at native or pretend to be naive tourists. After our klita package runs out, this freedom to choose is just about the only benefit we olim have left. Built up with confidence that the hotel receptionist was paid to be nice to me, I tried on my Israeli. I offered her my teudat zehut, my national identity card, instead of my passport when she asked for ID. “Oh, so you are Israeli?” she asked. “Well, sorta,” I answered, the only response that comes naturally to me at this point, only 18 months post-aliya and still struggling with the future tense. “Should we continue this transaction in Hebrew or English?” she asked me in a voice that sounded like a proposition. Considering the last time a stranger flirted with me, I almost considered continuing the banter in English. Lack of stimulating banter is one of the things I miss most in this country. Instead, I shyly told her we could try and see how far we’d get in Hebrew. We got pretty far. So far, in fact, I ended up holding a room key and a frequent traveler card. After check in, I proceeded to the elevator, where I found myself in front of a panel of buttons that resembled no panel of buttons I had ever seen in front of an elevator. I couldn’t figure out how to get up to my room on the 14th floor. I once again consulted the city-girl handbook in my mind and remembered words from the final chapter: “When in doubt, watch what the person next to you is doing and mimic her.” Which is what I did, and yet I still wasn’t able to get to the 14th floor; the elevator only stopped at 12. And there were no up or down buttons. I was trapped! Finally I asked the other rider for help — in Hebrew, but in a thick American accent because this is what you do in Israel when you need to ask a stupid question. She explained how the panel worked only by pressing the digits of the floor you need. By the time I got into my hotel room I felt really, really foreign. Like a big fat 7-11-slurpee-drinking, baseball watching American foreigner. I went to sleep a bit defeated. Tomorrow would be a new day…hopefully. The next day, however, didn’t start off much better. As I walked into the Agritech conference, my hands aching with the weight of the heavy boxes I was holding, the lobby was awash with long lines and pushing people. The wait at the registration desk seemed like it would take forever. Oy! When was this adventure going to get easier? I stood in line for a few minutes and then looked around. I saw that there was no one monitoring the entrance to the exhibition hall. I picked up my boxes and headed toward the entrance. The American in me was hesitant to cross the invisible line that marked the boundary between the registration area and the exhibit hall. I didn’t have a badge. I hadn’t checked in yet. I couldn’t just walk in, could I? But the Israeli in me holding the heavy boxes had no more patience to spare. And the Israeli is the one who crossed the invisible line. The American in me shuddered at what I perceived as a security breach, but the Israeli in me (and the former city girl) was proud when I made it all the way to the booth without being stopped. P.S. Thanks and love to Devora, my favorite Jewish cowgirl, for the inspiration for today’s headline.